When you have termites, you can’t hire just any pest control company to take care of the problem. 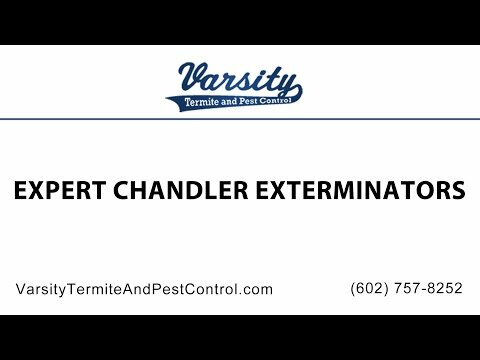 You need a company that is dedicated to or has specific training in Chandler termite pest control. General pest control measures are very different from effective termite treatment, so you need a company that understands the difference and has the skills and materials to apply those treatments. The goal of termite treatment is to eradicate the termites that are in or around your home. Termite. can multiply quickly, and they can do a lot of damage in a very short period of time. Leaving behind even a small number of termites in your home or the natural area around it leaves your home vulnerable to infestation. In contrast, pest control companies in Chandler typically aim to keep the pest population in check, not to eradicate it entirely. So the company would try to get rid of the spiders in your home but not everywhere around your yard, for example. Termite pest control aims to get rid of the population and to keep any new termites away from your property. The technicians who work for the typical pest control company do not have specialty training. They don’t need it. All they need to know is what kind of pest you have and where to aim the pesticide. They get that training very quickly when the company hires them, and they don’t need any additional education or specialty skill. The treatments are typically topical, and all these “technicians” have to do is spray the right pesticide in the right location. Termite treatment is much different. Subterranean termites are common in Arizona, and they live underground. They travel to the home through mud tunnels that they build, so they are always hidden. A termite pest control technician has to know how to reach those termites to successfully eradicate them. That can include digging into the ground, drilling through wood, positioning bait, and more. The process is much more complex, and it requires proper identification of the type of termite, where the termites are located, and how severe the infestation is. The process requires extensive training and skill to get right. If the treatment is done wrong, it’s worthless. It won’t get rid of all the termites, and it won’t prevent new termites from entering the home. If you don’t hire the right termite pest control company, you’re basically throwing your money away. When most people call a pest control company, it’s because they have an infestation and want to get rid of pests. They have a lot of ants in the kitchen and want to get them out. They have spiders in the garden and want to remove them. They are looking for a short-term solution, and the pest control company provides it. Termite treatment focuses on long-term solutions. It aims to get rid of the termites that are already in and around your home, as well as to prevent those termites from coming back. Often, a trench is dug around your home so that a perimeter barrier can be created to keep termites out. Treatment involves follow-up appointments to ensure that the termites are gone and that there are no signs of new colonies forming. Make sure that you look at only companies that specialize in termite treatment in Chandler. Otherwise, you’ll be throwing away money on ineffective treatments from unskilled technicians. Varsity Termite and Pest Control in Arizona has highly skilled technicians who know how to eradicate termites in your home or business. Our technicians perform a thorough termite inspection to understand the best treatment options for the type of termites and infestation that you have. We focus on long-term solutions to your termite problem, aiming to prevent future pest growth. As a pest control company, we also offer effective treatments for other types of pests that are common in Arizona, including ants, spiders, bees, cockroaches, bed bugs, and scorpions. Call us today to schedule a termite inspection or to get an estimate on other pest control treatments. Read the rest of Termite Control Services – Should You or Shouldn’t You?